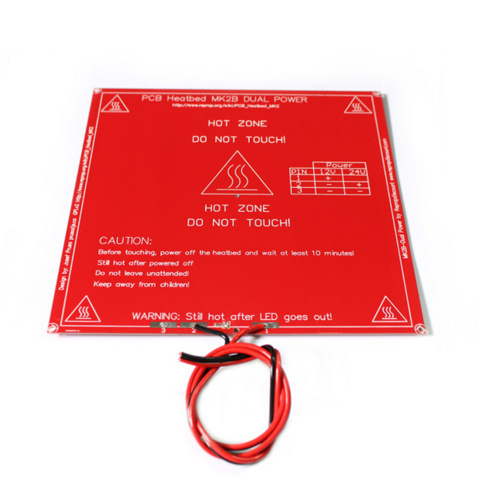 This PCB heated bed will transform your printing platform into a heated surface perfect for minimizing warping of larger prints as well as eliminating the need for a raft when printing with ABS. This is the latest, Mk 2B model which can be used with either a 12V PSU or a 24 V PSU. The platform has a 3mm hole in every corner for using M3 bolts. You may also glue or clamp metal disks on the corners and use magnets. However, it has to be mounted on a heat resistant underground. An insulating material below the heatbed is highly recommended. The PCB provides connections to solder the wires, thermistor, resistor and an LED. Caution: Use only cables which can withstand at least 15A and are able to withstand the heat. Most silicone and PTFE covered cables should do.In correct polarity of the power cable of heat bed will result in a damaged bed or board.